Do you want to promote your ADR practice with a blog, but don’t know where to start? Here is your opportunity to create and post your blog, live on the Internet. Blogging helps to encourage referrals from colleagues, brand your practice, and boost your speaking engagements. Bring your laptop, and learn how to create your own ADR blog! Our blogging expert, Vikram Rajan, will take you through the steps of setting up your own Wordpress blog and publishing your own article during the workshop (bring your finalized article). ACR-GNY members will also be able to publish their articles on the acrgny.org website. You will also learn best practices of making your blogs engaging, learn about comments, forwards/shares, social media Likes, and Google search engine optimization. In addition to his AICPA marketing columns and CLE-credit advertising ethics seminars, Vikram Rajan is the founder of Practice Marketing, Inc. and its Internet word-of-mouth referral marketing service, phoneBlogger.net. Vik serves as a Practice Marketing Advisor™ for CPAs, attorneys, and related professionals. He helps to develop and implement Marketing Action Plans (MAPs) within his clients’ codes of ethics and compliance obligations. Adding to his roster of speaking engagements, Vikram and his partner were the Opening Panelists for the New York City Bar Association’s Small Law Firm Symposium in November 2012. Vik’s book, “365 Marketing Thumb-rules: Daily Reminders for Rainmakers,” has received praise from over 15 organization leaders within the legal, accounting, financial services, and real estate professions. Vik’s marketing column premiered in the largest publication for accountants in Fall 2009 (the AICPA’s CPA Insider), was the most popular column in July 2011, and has been republished by the Journal of Accountancy (AICPA). His marketing columns have also appeared in the New York Real Estate Journal, Financial Advisor magazine, Long Island Business News, Dominican Times magazine, Times-Ledger newspapers, Personal Branding magazine, and more. Vik has taught classes for the Fashion Institute of Technology and has been invited by C.W. Post (Long Island University). Vik has also been quoted by the Wall Street Journal’s Startup Journal, Entrepreneurship magazine, Channel Pro, and more. In 2012, Vik appeared in an exclusive Forbes magazine roundtable with its editor. Vikram Rajan has presented in front of many professional associations: American Institute of Certified Public Accountants (AICPA) • National Conference of CPA Practitioners • Nassau County Bar Association (Academy of Law) • New York City Bar Association • Asian American Bar Association (NY) • New York State Council on Divorce Mediation • National Network of Accountants • National Association of Insurance and Financial Advisors (Queens) • Association of Divorce Financial Planners • U.S. Small Business Administration (SBA) • Independent Real Estate Brokers • Long Island Commercial Network (Board of Realtors®) • Direct Marketing Association of Long Island • Long Island Hispanic Chamber of Commerce • and has produced presentations with HSBC Bank, North Fork Bank, Suffolk Federal Credit Union, and more. 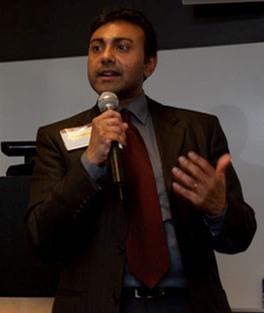 Vikram was named a “Top 40 Under 40 Rising Star” by Long Island Business News, in January 2005.